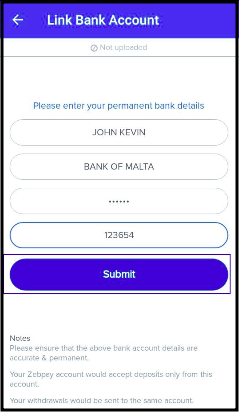 Once you've successfully updated your KYC details with us, you can register your bank account with us for all deposit and withdrawal transactions. Please submit correct bank account details, as it can take up to 7 days to change the account. Provide details for a bank account held in your name only. All deposits and withdrawals will only happen from and into your registered bank account. From the home page, select Link Your Bank Account, update your bank details and tap on Submit. You can amend your bank details at any time by going to the Main menu and clicking on Bank. 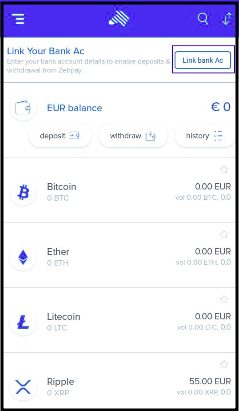 You can only register one bank account with your Zebpay account at a time.